All cakes are decorated with our signature non-dairy icing. Popular designs are basket weave, swag & tassel, scroll, feather & dots, dots/stripes/scroll, vertical, rough or smooth with ribbon bands. I will be happy to add your fresh or silk flowers to any of these designs. Also, for an additional charge white chocolate seashells can be incorporated into the design. 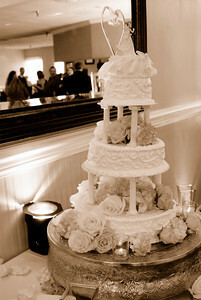 These cakes can be stacked, separated with columns, or placed on individual Lucite cake stands.